Throughout my career, I have normally been lucky and enjoyed what I do. I can probably say I am in my dream job at the moment. Are you in your dream job? I am an Associate of Coachilla, who sent me a mailer recently on an important theme and with their permission, I am using it for this month’s Meaningful Moments. Jim Collins is one of the best business thinkers alive. He wrote classics such as ‘Built to Last’ and ‘Good to Great’. One of his most inspiring ideas is the Hedgehog Concept. We can use it to discover our dream job and how to become successful at it. If you could choose: would you rather be a hedgehog or a fox? A lot of people will answer this question with “fox”. Foxes are faster, more elegant and sleek animals. They seem like the smart choice. But you might underestimate the hedgehog. 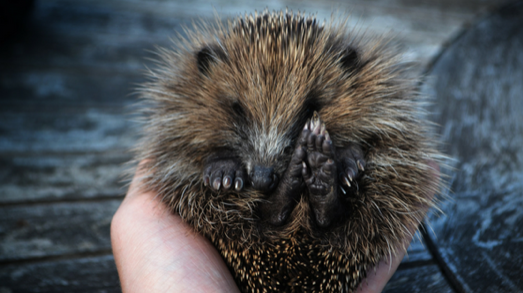 This ancient Greek parable explains the super power of the hedgehog. A fox is walking through the forest when it suddenly sees a hedgehog. The hedgehog seems like an easy prey, and the fox takes its opportunity to catch it. It tries out different strategies to attack the animal: it sneaks, pounces, races and plays dead. But every time, the fox gets defeated, being hurt by the spines. The hedgehog has a secret weapon. It knows one thing perfectly: how to defend itself. A hedgehog knows how to defend itself. We can adapt this parable to humans. In his book The Hedgehog and the Fox, philosopher Isaiah Berlin argues that there are two kinds of people in the world – foxes and hedgehogs. Foxes pursue many goals and interests at the same time. They are unfocused and will not achieve much in the long run. Hedgehogs are slow and steady. Unlike the fox, they can simplify the world and focus on one vision. This principle guides everything they do and helps them succeed against all odds. Jim Collins evolved this idea in his book ‘Good to Great’. He believes that businesses are more likely to succeed if they focus on one thing and do it well. This way they can beat their competition and become the number one in their business. He argues that successful companies like Apple or Microsoft were built by hedgehogs. Because of their hedgehog nature, they drove the business forward. How to find your hedgehog? Being a hedgehog is not something that you are born with. 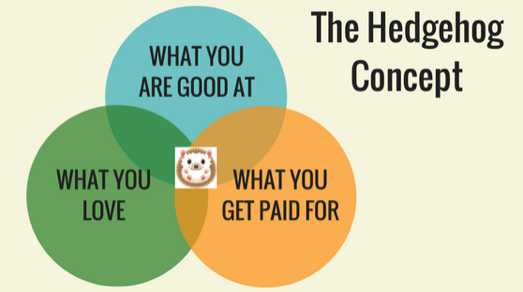 It is about the perspective you have on your business or your career. So, if you want to become one, you need to change your view. What will I get paid for? Where these three things meet, you will find your hedgehog. and we can see if we can find you your DREAM CAREER. ← What does retirement mean now, and can you benefit from a Retirement Coach?